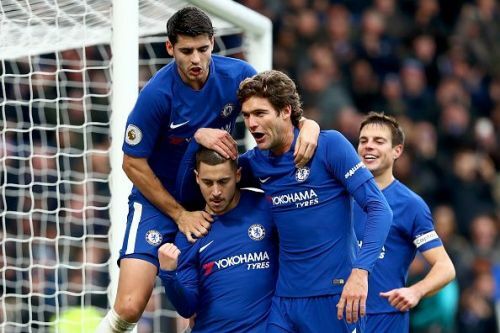 Chelsea welcome Swedish side Malmo FF to Stamford Bridge for the second leg of the Europa League round-of-32 tie on 21 February as they look to progress to the next round without any fuss, having already put their noses in front through a 2-1 victory in the reverse fixture. Recent stories have suggested Maurizio Sarri is on the brink of being axed owing to his stubborn nature, one-dimensional tactics and Chelsea's disastrous set of results of late. So, it would be safe to say that if the hosts endure another blip here, it would not only see them exit two competitions in the space of three days, but also conclude Sarri's time at West London. Although one of the major issues for Sarri's men has been their lack of clinical activity in front of goal, with a goal per game ratio of 2.8 in their last six Europa League home games, the Blues are handed a major boost. Also worth adding is the fact that Chelsea have won each of those games. On that note, let's bring you the team news and predicted XI of both sides. Maurizio Sarri, earlier in his press conference, confirmed that Ruben Loftus-Cheek is doubtful for the clash due to a troublesome back injury. Also to mention, Kepa Arrizabalaga will face a spell on the sidelines due to a hamstring injury, which might also keep him out on Sunday, when Chelsea square-off against Manchester City in the all-important Carabao Cup final. Meanwhile, Pedro is sure to remain out of contention due to a stomach ache, whereas Davide Zappacosta is out with a fever. Olivier Giroud is expected to replace Higuain as Sarri will rotate his playing XI, with an eye on the weekend fixture. The visitors have no fresh injury concerns heading into this game, and Rosler might stick to the same starting XI that played against Chelsea at home.